Dust Tactics is a tactical miniatures board game of ruthless engagements in which 2-4 players wage war against each other with the forces of rival factions belonging to one of the world’s superpowers. The Allies and the Axis control the majority of the world and are constantly battling for valuable and rare deposits of VK. Which battle will decide the outcome of the war? 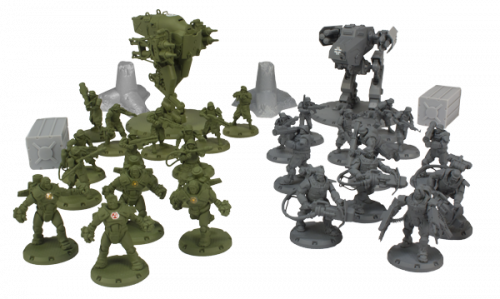 The Dust Tactics: Revised Core Set includes all the components necessary to immediately join your compatriots on the field of battle, and features the forces of two rival factions that are pre-assembled and pre-primed. When you are ready to move beyond the Core Set and customize the forces you bring to the battlefield, Dust Tactics has a huge and growing library of single unit expansions. A nice meld of board/tabletop war game with fantastic components (which btw can double for pieces for the equally excellent Dust Warfare war game). The alt WW2 theme fits nicely, and adds plenty of atmosphere without feeling like it was tacked on. The movement and combat is simple of enough, yet has a wealth of options to make it surprisingly complex over most boardgames (e.g. Risk, Axis & Allies). Pacing is fast, combat is even faster and brutal. There’s a host of official scenarios that are pretty balanced to keep you gaming for many sessions. The price point is pretty wallet friendly…although there’s a huge selection of units, it’s not necessary to field it all (and most everything is reasonably priced) – just cater it to your play style. Just like my review of the original core set, this is a great gateway game for people who may not have any or much experience with tabletop miniature gaming. It is a bit of a mash up that I would say puts it between mini wargaming and board gaming. I really like the art and style and found the rules to be very simple for a new player. I’ve since used this game to get other friends (that don’t game) into table top wargames. I consider it a gateway. It’s also nice for veterans if they want a simple fast game that can be played in 20 minutes. 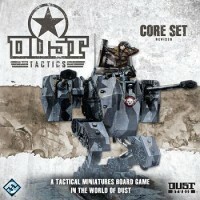 Add a Review for "Dust Tactics: Revised Core Set"